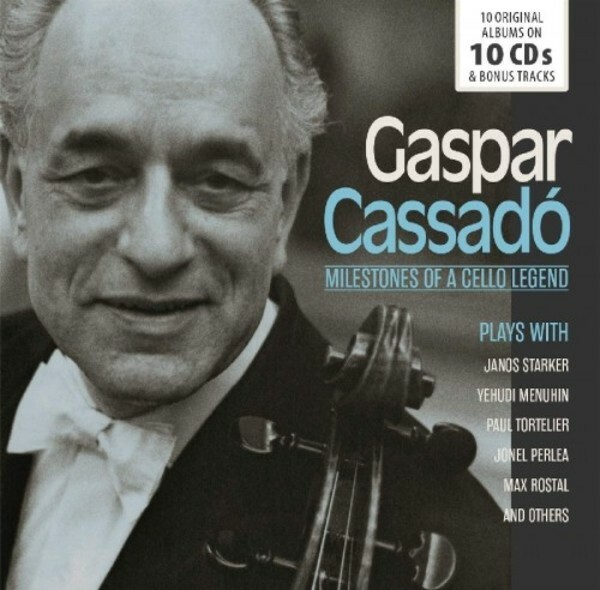 Gaspar Cassadó was one of the great cellists of the 20th century. Pablo Casals, who was Cassadó’s teacher in Paris from 1906-1912, called him his “fils spirituel” and predicted a great future. These 10 original albums from 1935 to 1961 (plus strong bonus tracks) contain some of his outstanding recordings, including the concertos by Schumann, Lalo, Saint-Saëns, Bach’s solo suites and the Dvořák Concerto. The latter can be heard in three recordings, from 1935, 1951 and 1956. Other works include Tchaikovsky’s Rococo Variations, Fauré’s Élégie and the second Haydn Concerto. The passionate chamber musician and arranger Cassadó is also well presented in this box-set.